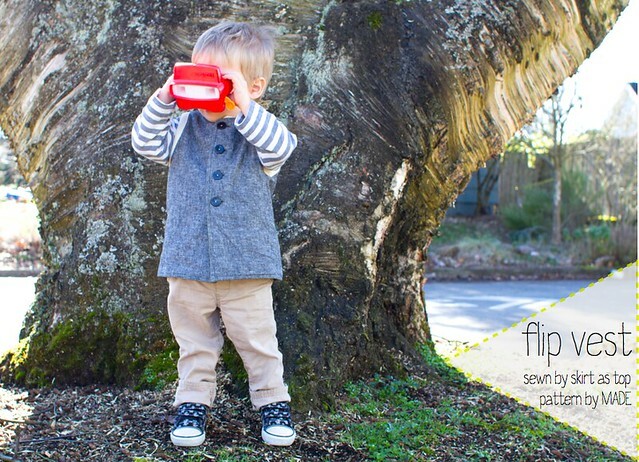 flip vest pattern testing and giveaway! i know you all know how much i adore pattern testing – i learn something every time i do it, i feel like i’m able to help fellow bloggers out, and it’s just a neat way to see other people’s processes. so of course when dana of MADE emailed me asking if i could test her newest pattern, i jumped at the chance. i’m pretty sure dana’s blog is the first blog i found that helped me discover the world of modern sewing 4 years ago, and it’s an absolute must-read. she covers lots of different crafty topics (in addition to sewing), has a fresh, clean aesthetic, beautiful photography, and a lighthearted attitude that makes her just so fun to follow. i admire what dana has built so much, and was so flattered she asked me to test this pattern for her! i really enjoyed the process and bouncing ideas off each other as i sewed. 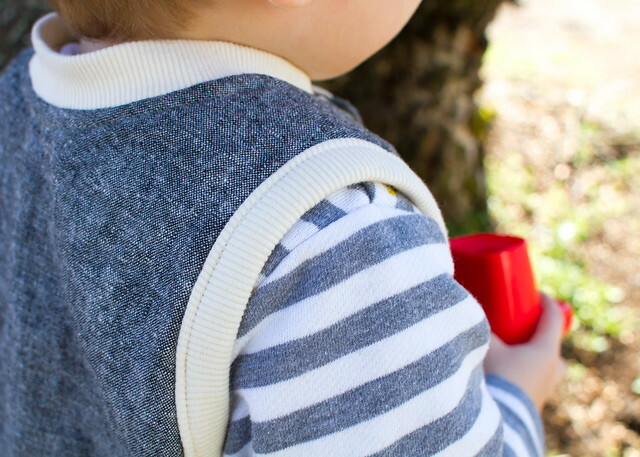 the pattern is called the flip vest – a cozy little vest for babies and kids that’s perfect for layering as we head out of winter and into spring. 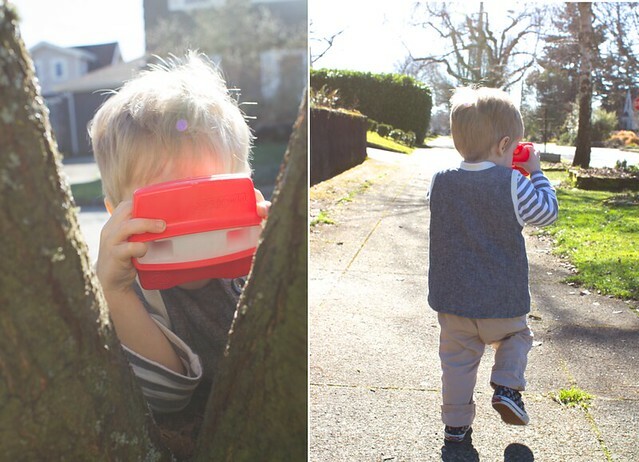 O has gotten so much use out of his vest already – it’s been under a coat on cooler days, over a light sweater on warmer ones…it’s really a fantastic transitional piece (i’ve got plans to make one for Em to wear on the playground too!). 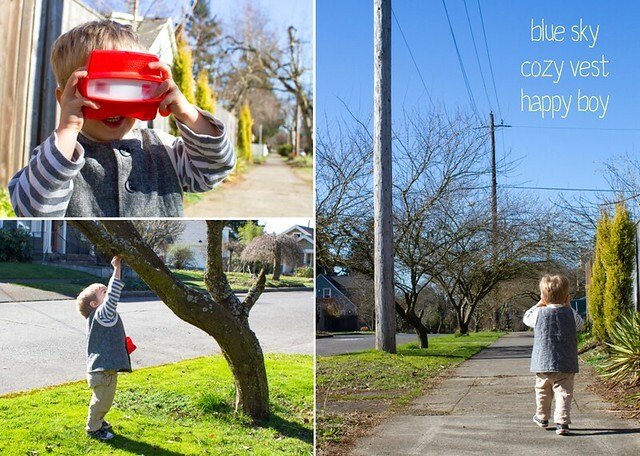 last Friday, we happened to have the most gorgeous day – and the little fella grabbed his “noculars” to head out for a walk. i had actually taken different photos of the vest already on a more typical overcast february day, but the sunshine definitely called for a reshoot. the flip vest is designed to be reversible if you use velcro, though i made mine button up so i could show off the essex yarn dyed black linen which i’ve now decided is my favorite fabric of all time. inside is a dark olive green micro fleece from Joann, and the rib knit is cream (also from Joann). this pattern is a very quick sew and takes very little fabric, which i love. one of my notes to Dana was to see if binding the armholes with a sort of bias bound method would work and she was totally open to it, so i tried that and it ended up in the final pattern as one of two armhole finishing options. you probably should use a walking foot if you do this, as the fabrics get a bit thick all together, but i think it gives you a really nice finish. i sewed this vest in a 2/3T, and the width came out great but it’s just a tad bit long on 2-year-old O – Dana shortened the length from what you see here in the final pattern. his sweater underneath is this sailboat top made last year, which fits perfectly now! don’t you think the vest looks sort of old timey with the linen and buttons? it’s like i’ve already got the “There Will Be Blood” film petit halfway done. ha! okay, so how about a giveaway?? Dana has generously offered THREE flip vest patterns from her pattern shop for me to give away – that’s three different winners! you may not fully realize how much you need this pattern, but you DO. you NEED it. it comes in size 6m – 5T and i can see it becoming a wardrobe staple for both of my kids – a fun and easy gift to make for others, too (did you see Delia’s versions? adorable). leave a comment, any comment. i’m feeling ready for spring these days, so if you need an idea of what to write, how about telling me your favorite flower! giveaway is open until friday, feb 22 at 5pm PST. make sure you leave a valid email address with your comment. i’ll pick three winners on friday and put you in touch with Dana to receive your pattern. P.S. did you see Dana and Rae are joining forces for Celebrate the Boy again starting next week?! soooo fun. can’t wait. i’m always in need of some good boy sewing inspiration. My favorite flower has to be tulips, I love all their colors. I am with you on the value of vests….totally necessary layer piece as we move into Spring and my 4 have outgrown theirs from last year! And one of my favorite flowers are the crocus….up here in Gloucester, MA they are the troopers of spring as they pop up out of the ground with little snow helmets! 🙂 thanks for the review and chance to win! Would love to win a copy of this pattern! Love the vest! Thanks for the giveaway. And, since you asked, my favorite flowers are peonies – they were in full bloom when we moved into our new house a few years ago, so they have a special place in my heart. Happy (almost) spring! Such a cute vest, and perfect for Spring, when you never know what the temperature will be. I’d love to try this vest pattern ! And my favorite flower is probably daffodils, one of the first to come to us in Spring. I love your version! I feel like I need this pattern now because both of my sisters are pregnant! My fav flower is garden roses! Aww!! O looks totally cute! Great pattern review, and I *heart* Essex linen too — made a pair of pants for E out of that exact stuff. Love it! I am loving seeing all the different vests that people are making! It really is a great garment for the kiddos as the weather changes! Yours is fantastic! You are right, everyone need this pattern! Perfect for those sunny but still slightly chilly spring days! I love sun flowers! I also love this vest. Thanks for the chance. I love daffodils. They are truly a spring flower to me, and it makes my day bright when I see some! What a pretty version you made of the flip west! Although I can’t tell you much about flowers except from the fact that I definitely NEED spring – I would love to win the pattern! Fun! I’d love to win! And I LOOOVE tulips! My tulips & narcissi are popping like crazy! I live in northern California, and spring has sprung! These would make great spring vests. I have two grand boys I sew for and love the color options of the flip vest and would love to try it. I love the color options of the flip vest and it would look great on my two grand boys age 2 and 4 that I sew for. Love your vest! I agree everyone needs this pattern! My favorite type of flowers are English roses. I reeeaallyyy like this one, Kristin. I was wondering what fabrics I could use to make it a little dressier and I love your combo for this one– it looks amazing! Both warm and stylish. I love it! The sun is shining here today and it totally feels like spring! So happy! My favorite flower is the Siberian Iris. Cute! Love that linen – still need to get my hands on some . . .
Love the vest…also love begonias! Love your version of the flip vest! I’m really gonna have to get some of that linen. I’m seeing it everywhere and it goes with everything. I’d love to win a copy of this pattern. I have made 3 or 4 different kinds of vests for my kids but this one looks superb. Cool vest! A puffy vest is always part of my kid’s mud-season wardrobe, but I’d love to sew this one up in wool for something a little more polished! I love the little Spring Beauties that blanket the ground. Thanks for all your beautiful work and generous giveaway! Love the Spring too, but have to wait until MAY!!! Love your version. Super cute vest! That fabric is seriously awesome. And hydrangeas are my favorite. They made for a great bridal bouquet 10 years ago with little roses interspersed! Love the vest. Favorite flower today is tulips 🙂 hillary (at) redballoonpr (dot) com. my favorite flower is magnolia, now here in spain we may see a lot of magnolias in the street. this vest seems to be a basic pattern to sew. Those buttons look great! I love the new vest, and great sizing so I can make one for each of my three little chicks. We are in Summer here in Australia, but Spring is my favourite season, it’s warm but not hot and we have some spectacular flowers around our house that bloom. Walking to school we past so many old houses that the owners are obviously more green-thumb than me and the smells amazing. My kids would get so much use out of these! And my favorite flower is probably the daffodil — they just look so happy. You did such a great job! And oh my goodness your little one is getting so big! Adorable! I have a vintage quilted floral bedspread that would make an awesome vest – and is very springy. Which will help me feel a bit better about heading into autumn! oh, and favorite spring flower: gah, all of them! But daffodils, lilacs, violets, and daphne are some of my favorite favorites. Looks like a great wardrobe staple for boys. I like the fabrics you’ve chosen, lovely pics too. It’s coming into autumn here in Australia – this would be great for the change in season! Looks like a great basic pattern that leaves a lot of room for customization! Errr was that a film petit hint there?! Dana was my first DIY mumma blogger that I stumbled upon and o.m.g. I doubt I would be right here commenting here if it weren’t for her. I wouldn’t have discovered how fun sewing for little kids is! WAY faster than sewing for myself, and I’m an impatient girl! The flip vest is ADORABLE. and it’s almost auuuutummmmnnn here! WOW! I can´t resist a vest in linen. I´d never have thought of using linen, it´s smart, casual and just brilliant. I love it Kristin. LOVE the vest! So (sew) will my grandkids! Love all flowers but LOVE bleeding hearts – more of a bush than flower, though. Have a great day and thanks for the chance to win. Love this little vest and have twin nieces it would be fun to make them for! Love! Oh and did I mention that I LOVE this. My favourite flower is a ‘passiflora’. I don’t know whether that’s correct in English, it’s a Dutch word. But that’s the one! I love the pattern! And I love lilies of the valley…such a sweet smelling spring flower! Love this vest!!!! My favorite flowers are peonies!! 🙂 I’d LOVE to do this vest in Sarah Jane’s out to sea pink anchors for my little girl! I’d love to make this vest for my guys! Gerber daisies, hope to win! i love daffodils. when i lived in idaho it was always the first flower i would see poking out of the snow reaching for the spring sun. Great vest! and peonies. and lilacs, for the smell. I love this vest! Fantastic! Yay for Dana’s patterns! I would love to make one of these for my little guy. And I love peonies. Tulips are my fav flower! I love love Dana’s website. she inspired me to start sewing a few months ago. What a cute vest pattern, my daughter and son both love vest to coats in spring so this would be great to whip up for them to wear. I love her tutorials, and your version is great for a little man. Thanks! I love the boy version so much!! My favorite flowers are lilies! SWEET pattern!! And I love daisies! I love her patterns and would love to have her latest. Thanks! Would love this pattern for my three little munchkins. I love Dana’s designs! I would love to be one of the winners!!!! I LOVE the fabric you chose!!!! I would love to try this pattern. 🙂 hi. DAHLIAS! Thanks for sharing your process with us! 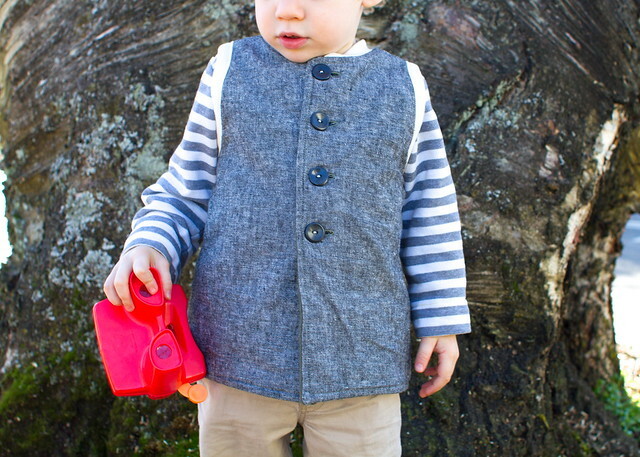 I’d love sewing this vest for my little boy! I can’t wait for celebrate the boy but this vest eye candy will tide me over! must get me this pattern! Woohoo! Celebrate that adorable little boy in his fun old man vest. LOVE IT! gerber daisies for me. 🙂 oh yes, and the vest would adorable on my boys. This is such a versatile pattern and would be fantastic for my twin girls I have the perfect spring fabric in my stash I think it is a Northcott flower of the month and is beautiful brightly coloured hollyhocks! My favorite flower would have to be tulips. They are so pretty when they come up! I would love to make this vest for my little brothers and sister. My favourite flowers are yellow roses! My favourite flowers are freesias. Such a gorgeous smell. And you’re right, I need this pattern! You did an awesome job on the flip vest!!! I love red roses as they remind me of my Grandma…. Love this! I love iris’. Thanks for the giveaway! I love crocuses. They are so hopeful. I love roses and they aren’t nearly as fussy as people think they are (the same with orchids). I grew up in Portland, OR and was spoiled with weekly trips to the Int’l Rose Test Gardens during the summer! What a gorgeous vest! I love fresias – you know spring is on the way when they start to bloom. Those buttons are just to die for! I love that they end a little higher than their waist to let the bigger bellies have a little room! Just perfect for a toddler! I have three littles that could all use a vest. Thanks for the chance! I love tulips &peonies. & I would LOVE to win this pattern! My little guy would be cute in this vest! thanks for hosting! i really like flower lily of the valley – so delicate and pretty. This vest is sooo cute!! I love the look! Thanks for the giveaway! What a great pattern and your version is so cute. I love your fabric choice and would love to get one sewn up here for early spring. Thanks! The vest you made is adorable! I love the fabrics you selected. I love the style of this vest! I’d love to make one for my son! I’d love a free pattern! My favourite flower is a fairly slipper. Love finding them growing wild in the woods. I love lobelia 🙂 and I would love to sew this pattern up! 🙂 thank you forThe chance at the giveaway! I would have to say the crocus. Have you seen them around portland? I have spotted a few here and there! Crazy! I love this pattern and would love to try for my boys! Super cute vest! Would love to try to make one! Lily of the Valley. Love it and this vest pattern! Awesome! My kiddos could some cute new vests and I’m ready for a new project. Would love to win! We can’t wait for spring either! Thanks for the giveaway! 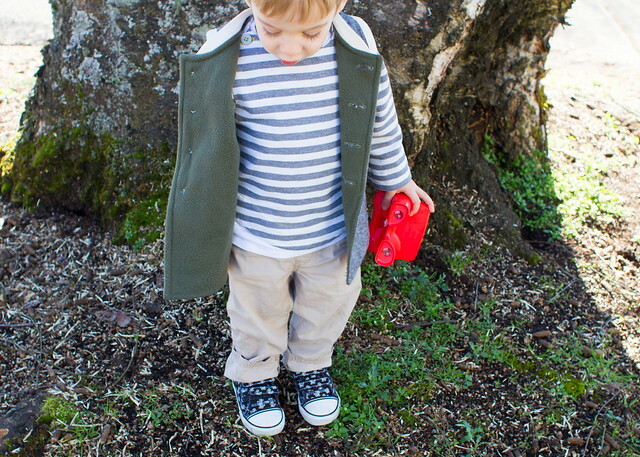 Gergers are my favorite…thank u for the giveaway…adorable vest! We’re finishing up with summer here in Australia and I’m looking forward to Autumn. This pattern would be so perfect for us. Thanks! I love planting giant sunflowers. I planted them for a couple of years and then my husband loved them so much he took over. I love the giant ones because they can grow taller than I am. Amazing! Thanks for the giveaway. I’m contemplating saying goodbye to summer here in Cape Town as the nights are noticeably getting longer. But, we’ve planted sweetpea seeds so am looking forward to those growing and being able to pick and enjoy in a few months’ time. Thanks for the opportunity to enter your giveaway. I love the poem, I love the flowers! My baby just turned 6 month and she is ready for the vest, plus it’s gonna be perfect for spring :-). I also love tulips and peonese! My favorite flower is cayena. I guess it’s so called hibiscus. We used to have cayenas in our backyard, pink and white, covering along the fence. It was always wonderful to watch at all those delicates spots on top of the green leaves. It would be a great idea for colors in a vest for my daughter… just recalling. I love linen so much… I think my favorite flower is the rose, but not a big, fancy, over-blown roses–just the little wild-type roses. The pattern is fabulous. I love poppies and daisies. Thanks for the giveaway! I am heading to the garden store today to get my garden started for the year. My first year gardening in the bay area, hope it goes ok! Love this vest! So cute. lovely work 🙂 I like the versatility of this pattern. This is a fun pattern. I love ranunculus. 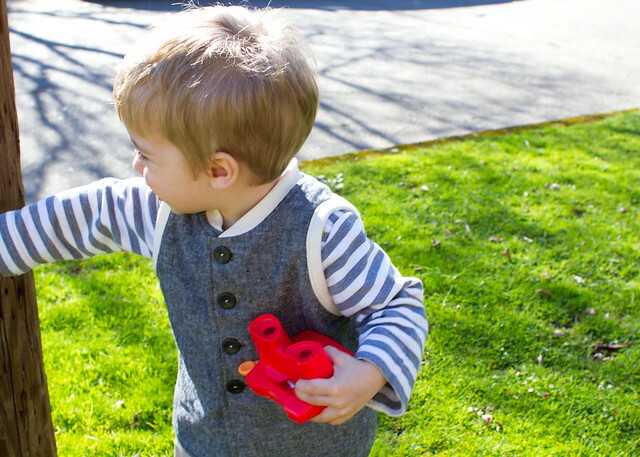 My little boy loves his ‘noculars’ too! love this pattern! if i have to pick a favorite flower it would be a three way tie- poppy, tulip and hydrangea. thanks for the giveaway! My favorite flowers are sweet peas and peonies. Love your version of the vest! Love the look of this pattern! My favourite flower is yellow roses! the vest is so adorable..
my favourite flowers lare tulips. That linen is beautiful — I think it kicks the whole thing up a notch. adorable! I want tomake these for my boys and line them with some cute patterns that I wouldn’t normally use in clothing. it would be like a little secret between us. how did I miss this! How awesome to pattern test for Dana’s patterns! Love your combo with the striped tee underneath!